If Resident Evil is gaming’s equivalent of a horror flick, then Disaster Report is, as the name suggests, its disaster movie. Raw Danger was the series second instalment, succeeding the flawed but diverting SOS: The Final Escape in 2007. This time, GEO City (a rather drab reimagining of New York) has been hit by a tsunami, and you’re catapulted into a story that plays out from no fewer than six perspectives, as each character must escape the hazardous, crumbling cityscape. And this means a third-person adventure that mixes survival elements with exploration. There’s no combat, so the main threats come from falling debris, raging torrents and the impact conditions have on your character. It’s one of Raw Danger’s most distinguishing features; rather than having a health bar, characters instead have to keep dry and maintain body temperature. Getting caught up in rain or snow can soak them and cause it to plummet, thus finding shelter becomes important. You can scavenge various bits of clothing to form some hilarious outfits (never has dressing as Santa seemed less appropriate in the context of a game) and there are various food sources that can be cooked on heaters, which double as save points. Unfortunately, while Raw Danger retains its predecessor’s sense of high-theatre and the occasional grand action set-piece, it also inherits a host of its most undesirable traits, chiefly its unabashed ugliness. It wouldn’t have passed muster as a launch game; buildings are relentlessly dreary, whilst the wooden character animations and bland textures have the look of a PSone game that’s undergone a bit of corrective surgery. It's also hopeless at handling its own rather tepid special effects; whenever there’s any rain, tidal waves or general activity, the frame-rate descends into a jerky, vomit-inducing mess. The locales are at least distinctive, but it fairs very badly in the graphics department. Overall presentation isn’t helped by lumbering, nineties-looking menus that are punctuated by spelling and grammatical errors, giving it the air of a game somebody translated over a lunch break. It’s also blighted by abysmal sound quality. Half of the voicing cast sound so stiff you’d be forgiven for thinking they were reading their lines at gunpoint, whilst the other half seem like inebriated drama school rejects. Environmental sound effects are consistently too loud, drowning out music and dialogue, whilst the blaring wind effects regularly shifts cut in and out horribly, as if someone was working the gales with an on/off switch. …And to bring the dodgy diagnosis full-circle, the gameplay mechanics are highly suspect too. The collision parameters constantly see the player becoming snagged on scenery, something which becomes especially problematic when steering a boat against a strong current, or when the taxi gets anywhere near to a wall, curb or indeed anything that isn’t strictly road-shaped. In most of the stories, you have an accomplice, who you can share resources with, but disappointingly their roles are almost non-existent, reduced to little more than window-dressing. When approaching a dip or a step whilst running, characters have a tendency to launch into a full-blooded jump, usually off a precipice or into a tidal wave, so you’ll experience many unintentional suicides as a result. It’s fair to say that were it any other game, Raw Danger would be on its way to scrapheap without a second glance. And yet, for all its many shortcomings, it’s absorbing enough to keep you playing to the end. You have to admire a game that does things differently, and it remains somewhat unique amongst its peers. Whilst technically it’s in such a sorry state that, if anything, it appears to have regressed from the relatively meek standards set by SOS: The Final Escape, there are a few areas which have seen positive growth. Most notably the storyline which, whilst not always articulated with any great sense of eloquence (certainly not in terms of the voicing), is impressively ambitious, not only drawing on the experiences of multiple characters but interlinking and overlapping the events of their stories so as to impact upon one another at various points. The quality of each instalment is inconsistent, but the opening two at least are very good. Joshua, the first playable character, has the most substantial section of play. Beginning as a waiter, he must make his escape alongside co-worker Stephanie in a quest that sees chance encounters with several future playable figures. In two direct instances, your decisions will affect how the next scenario, that of Amber Brazil, a woman wrongly accused of killing her brother, unfolds. As Joshua, you spot Amber hiding behind a car, and can choose to aid or give her away to the detective who asks about her whereabouts, leading to alterations in how her game at the point of overlapping plays out. Likewise, should Joshua take the easy route through the subway by yanking an iron bar out of his way, it will collapse on Amber, prompting another tricky situation later on. Amber’s attempts to evade the police reprise the stealth sections from SOS: The Final Escape; they’re nothing overly fancy but work well enough, and dressing her in police uniform to avoid capture is a nifty touch. Stories three and four are more like filler. Taxi driver Isaac utilises his vehicle as a gimmick to move around portions of the city. It makes for some cool action sequences when you’re met with rising tides, but there’s very little freedom and the locations seem extremely small and restrictive in a car. Isaac also has an annoying need to say 'what’s that?!' in a ludicrous pitch whenever you examine a piece of the scenery; it’s enough to drive you mad. The extremely brief fourth story that follows in a high-school is memorable if only for the appearance of the hilariously perverted 'villain' Mr Savage, whose clawed hands and stooped gait bring to mind a modern-day Nosferatu – if he had fair hair, was a teacher, and lusted after schoolgirls, that is. It’s difficult to say whether his brief chase after playable character Paige is disturbing, or side-splitting. Perhaps both. Her story lasts only around half an hour and requires few survival elements as you’re never really in contact with rain or wind. Things come to a close with a more elaborate and tricky (as you’ll have picked up most of the resources in earlier runs) fifth story that follows a scientist trying to regain his memory through clues you accrue. It’s one of the better strands, if you can excuse the fact you’ll have seen most of the locations at least twice by this point. There’s also an additional sixth story from the point of view of reporter Keith Helm, the rather anonymous ‘hero’ from the previous game, which makes for some nice fan service. There’s scope for replay value. At around 11-12 hours first time through, it’s nearly twice as long as its predecessor, and with so many decisions affecting so many possible endings, it’s good for a couple of full run-throughs, at least. The effects of your often lead to very different outcomes; choosing to be good will see you rewarded for going the extra mile, whilst if you’ve got a mean streak, you can let certain individuals fall to their deaths, or take glee in being generally rude to everyone and seeing their uncomfortable reactions. 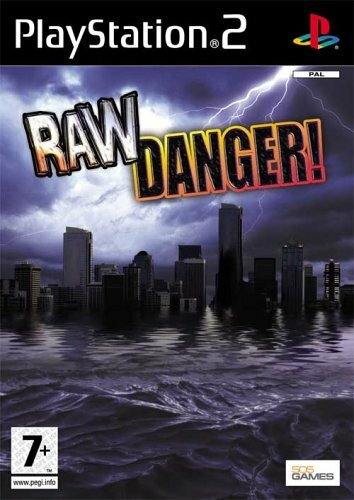 Raw Danger tests the gameplay-over-graphics adage to the max. Admittedly, it isn’t exactly brilliant to play and feels a bit sparse next to its predecessor, but it is clever and it is different. If you overlook the awful presentation, there’s a narrative that is worthy of credit. Certainly, there are many better adventure games available for the PS2, but few are quite like Raw Danger, so if you’ve ever thought of immersing yourself in a disaster movie atmosphere, then you might just find something to like here – just think B-movie rather than blockbuster. "...for all its many shortcomings, it’s absorbing enough to keep you playing to the end. You have to admire a game that does things differently, and it remains somewhat unique amongst its peers"